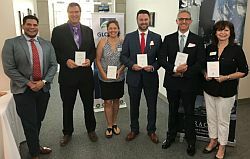 We’re proud to announce that we’re new members of Global Chamber Tucson Chapter, the first and only chamber of commerce that is focused on growing cross-border trade and investment. The Global Chamber’s focus fits our mission of working with diverse manufacturing companies both in U.S. and abroad. We’re looking forward to being involved in the Tucson Chapter, with its strategic position in the borderlands mega-trade region and in a growing technology and manufacturing hub.